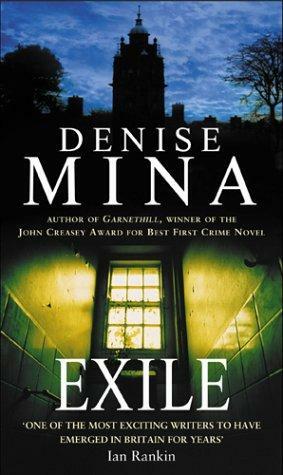 The second book of a trilogy, Exile continues the story of Maureen O’Donnell, abuse survivor, ex-mental patient, reluctant volunteer shelter-worker and genuine heroine for the age. Having survived the dramatic events depicted in Garnethill Maureen is spending her days trying not to cry and volunteering in the office at the Place of Safety women’s shelter. When Ann Harris, one of the women who had stayed at the shelter after supposedly being beaten by her husband Jimmy, goes missing no one but Maureen’s best mate Leslie seems bothered. When Leslie involves Maureen in the search for Ann, Maureen soon learns that all is not what it seems in Ann’s life. I’ve put off plucking this book from my TBR pile for ages. Though there was a little apprehension that it might not live up to its predecessor (one of my top ten reads of 2009) my main reason is that I wanted to save it for a time when I needed a guaranteed great read. Happily my ‘second book’ apprehension was completely unfounded and Exile delivered on its promise of being an absorbing, gut-wrenchingly sad and darkly funny book. It’s hard to know which of the dozens of brilliant things about this book to highlight in a short review but I have to comment on the writing which is superb. It is richly descriptive without an ounce of floweriness or unnecessary length and seems to leap off the page in its desire to be read, savoured and rolled around one’s tongue. There are gems scattered all throughout the novel but perhaps they’re illustrated best in Mina’s descriptions of her characters. Leslie is introduced with “…[her] hair was short and dirty and stuck up like a windswept hampster’s…She walked into every room as if she was there to get her money” while one of the policemen is described as “…an officious prick with a Freddie Mercury moustache and the social skills of a horny lap-dog”. That’s my kind of imagery. The characters are another standout feature of the novel. For me Exile is about an underclass of abandoned, abused and abjectly poor women who are heroes in exactly the way those our society labels as such never really are. Maureen is the kind of person you want to wrap in a hug due to the traumas she’s been through, then you would re-think the folly of hugging a cactus. She launches into everything at an often reckless full-throttle and is dogged, loyal and though plagued by self-doubts I’d want her on my side in any fight. Then there’s Leslie’s mother, having raised two generations of kids virtually on her own and nearly dropping with age and fatigue she is ready at a moment’s notice to go to the aid of Ann Harris’ 4 children to save them from going into care. Even Maureen’s own clinging, alcoholic of a mother sobers up when it looks like her grandchild will need her intervention. These are people I won’t forget in a hurry. Finally there’s the story itself. Against the backdrop of Mina’s brutal, sad and violent Glasgow an utterly compelling tale unfolds. It’s only crime fiction in the loosest possible sense, being more a story of intertwined lives of desperation, courage and surviving bastardry in all its forms. And for me the thing that saved it from being worthy misery lit, which a book tackling such subjects as this one does could easily become, is the vein of dark but totally credible humour evident from beginning to end. As if Mina is saying this is how real people do it. This entry was posted in book review, Denise Mina, Scotland. Bookmark the permalink. Thanks for your review, Bernadette, I’ve just added the trilogy to my wish list. Bernadette – Oh, I like Denise Mina’s work quite a lot. I agree with you, too, about her writing style. I’ve only read Garnethill in this series, and you’ve given me a very welcome kick in the pants to get on with it and read this one. This trilogy was one of my best 2010 finds, and your review has made me want to read it all again. And if you think Exile is 5 stars, you´ll have to invent 6 stars for the ending. I loved this book. In fact, I loved the trilogy. Maureen O’Donnell is such a real person. And one aspect I liked a great deal was the character of Glascow and all of its economic and social problems; this was the underpinning of everything. The characters, plotting, location, depiction of social and economic issues, and more made this a great read. And your review just caused me to add it on the TBR list to be reread. How could I not? I read the first two books in this trilogy years ago – must be at least 6 years ago and remember them being amazing. I am not really sure why but I have never read the third book, or any of the others books she put out. Thanks for writing about this book as it is completely new to me and I’ll just have to go and find a copy new – great review – thanks again.